Fans were in for a BIG surprise when late Tupac appeared on stage and danced along with Snoop Dogg. Dr Dre and Snoop Dogg resurrected late rapper Tupac Shakur as an onstage hologram singing hit songs and wowing crowds alongside other hip hop stars to close the first weekend of the Coachella Valley Music and Arts Festival on Sunday night. The life-sized figure of Shakur, who died at age 25 in a 1996 shooting, appeared on stage with Snoop Dogg causing a lull to fall momentarily across thousands of people gathered to see the set. They couldn’t believe their eyes. 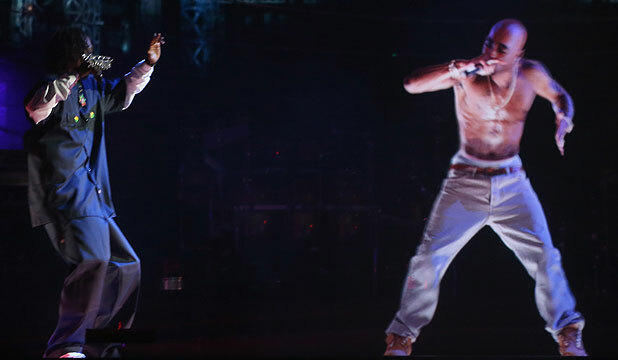 The Tupac hologram performed “Hail Mary” and “2 of Amerikaz Most Wanted” with Snoop Dogg before dissipating into thin air, leaving the audience in awe, and somewhat unsettled, by the technology used to make the rapper reappear and perform. Nate Dogg, who died last year aged 41, was remembered by Snoop and Dr. Dre through a montage of photographs and a performance of “Ain’t No Fun,” featuring Warren G and Kurupt, all of whom had worked with Nate Dogg over their careers. The Coachella closer came after a hot list of acts performed in the sunshine during Sunday, finally allowing festival-goers to party in warmth after cool desert weather blanketed the event from its outset on Friday.